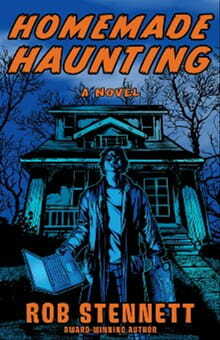 EDITOR’S NOTE: The following is an excerpt from Homemade Haunting by Rob Stennett (Zondervan). I would have never followed this path all the way down to its inevitable conclusion if it weren’t for two questions. The first: Does God exist? And the second side of that question is: Does Satan exist? Not that I thought about Satan very much. And as for God, early on I decided that I did not believe in him in any way, shape, or form. I wasn’t a cynic. I believed that people had the ability to do unthinkably kind, generous, and heroic acts. I just didn’t believe God had anything to do with them. God can’t protect a family as their minivan sails through a crowded intersection, he can’t influence the outcome of a football game by commanding an angel to flap his wings to cause a field goal to slice wide right, and he certainly can’t convince a man standing on a bridge ready to take the final plunge that life was worth living after all. God couldn’t do any of these things. Not because God was a jerk — he simply wasn’t around. I didn’t arrive at this conclusion by reading Richard Dawkins and deciding belief in God is the reason there is so much war and poverty in the world. I didn’t come to this conclusion by getting frustrated with inconsistencies between the Old and New Testaments. In fact, I wasn’t even reading much besides Charlotte’s Web back then. And it’s not like E. B. White influenced me — a spider didn’t appear and weave “God Is Dead” into its web. But this journey did start when something uninvited came into my room. I was seven years old and it was a sunny afternoon, the type of day where I should have been outside playing baseball until dusk when supper was ready. Instead I was in my room surrounded by Legos because I wasn’t very good at baseball. “Wasn’t very good” is being kind — I was a train wreck. The first time I ever got a hit I ran to third base. Everyone was screaming “No!” but I assumed they just couldn’t believe I’d actually hit the ball. I played left field, and when the baseball came at me, I curled my arms around my face like someone had just lobbed a grenade. After a while I decided my afternoon was best spent skipping the humiliation, so I spent my time alone reenacting medieval battles with Legos. When I was in my room my parents almost never interrupted me, and if they did I knew there was a problem. We didn’t raise you to act like an animal. If you can’t be civil then we won’t let you play outside at all.” After that I’d be grounded for two weeks. But on that day it was different. I knew it was something serious, but their tone was gentle and soft. Something bad was about to happen. “I just got back from the doctor. He said I’m sick, honey,” Mom told me. Then she started to cry. I felt like I wanted to cry too, but I didn’t know exactly what was going on. “Your mother has cancer. Do you know what cancer is?” my dad asked. “Yes,” I answered, even though this wasn’t completely true. I knew there was such a thing as cancer; I knew cancer was a scary and serious word, but what it was exactly and how it worked was beyond me. My parents accepted my “yes” because they didn’t want to get into the specifics. Besides, they were as mystified as I was. “They’re going to give her treatment,” Dad said. “And the treatment is going to work, but the medicine will make her tired. So we need you to be really good right now. Help around the house. Don’t get into any trouble. We’ve all got to pull together to fight this. Okay son?” Dad said. The treatment did not make her better. It made her skin brittle, it made her lose her hair, it made her sit on the couch around the clock and watch soap operas. And I would sit at the other end of the couch and discuss the plots of General Hospital with her. She was too weak to get up and change the channel (back then, we could only imagine what it would be like to be one of those families who could afford a TV with a remote; we couldn’t afford much of anything with all of her hospital bills stacking up) so my primary job for this portion of her life was to switch the TV from General Hospital to Guiding Light to Days of Our Lives. Toward the end Dad told me, “It’s looking bleak, son. We’re going to need a miracle for her to make it now.” My dad was raised Catholic so we started going to mass to pray for her. I remember going up to this altar and lighting a votive candle for Mom. I remember sitting and staring at that candle and imagining God way up in heaven looking down at us on earth. I pictured God using his X-ray vision to look inside the church and see my candle burning so brightly and profoundly that he would use his powers to heal my mother. I fully expected I would come home from church to find my mother completely healed. She would pick me up and kiss me over and over again and say, “I’m healed!” through her tears. Our lives were being taken over by bad dialogue and unbelievable plot twists. But they were all Mom wanted to watch. Game shows were too loud; sitcoms too silly; my horror shows were too scary. Mom found her only solace in affairs and mistaken identities and confessions of secret desire. Mom watched soap operas (it got to where she almost never left the couch) while Dad and I went to church to light candles and pray for her. And it was one night when I looked at all the lit candles and wondered how many of those were for other moms who were dying of cancer. Why didn’t we hear good stories of things happening with these candles? Why was it the same people every Saturday night, the same hopeless stares, the same candles flickering pointlessly? When we got home Mom wasn’t there. We learned later she’d called a neighbor who took her to the hospital. By the time Dad and I arrived a doctor was waiting to meet us. He asked to talk to Dad in private, and through the glass in the other room I saw Dad cry for the first and only time in my life. He was still strong as my dad always was; he locked eyes with the doctor and nodded as the doctor was no doubt giving him the details of my mother’s death. For a moment Dad looked away from the doctor and caught eyes with me. His look told me everything. It said, Well, it’s just you and me now, Charlie. When I looked at her, I thought of the bouquet of helium balloons I’d gotten for my birthday that year. At the party they were colorful and full of air. They seemed ready to race to the sky — if only the ceiling weren’t in the way. But slowly, over the next two weeks, the life started to leak out of them. At first I noticed they were no longer reaching the ceiling, then it seemed like just staying off the floor was a chore. Finally they were lying on the ground, flat and lifeless, and I could barely remember when they were so vibrant and full of life. My mother was a helium balloon. We had been discussing the latest General Hospital. I was the only one around for Mom to discuss soap opera plots with. I loved those discussions because Mom didn’t look at me like a child. I was a peer and a friend. I think this change happened when she started realizing her fate. She understood she’d never get to see me holding a college diploma, she’d never help me think of creative ways to propose marriage, nor would she give me advice on how to raise my own kids. The most adult moments she’d ever get to have with me involved the plots of As the World Turns. When we went back to mass for the funeral I stared at those candles again. As everyone bowed to pray I held my head up because I knew there was no God to pray to — if he was out there he would have healed my mother. He would have done something for me and for all those other people who light candles and cry out for him to save them. The pallbearers carried my mother’s casket, and I followed it and left the church. Any chance I had at having faith in God left with me. **Even at a young age I loved horror movies. They take you to another world and always make me jump a little. All my friends got a thrill from riding roller coasters. We never had the money for amusement parks so I had to find thrills from werewolves and axe murders. †I didn’t just like horror. I also appreciated the acting talent of Ricky Schroder.